This is the first movie that I've ever given five stars to and at the same time, am warning you to stay away. This brilliant film from accomplished director Alejandro González Iñárritu (21 Grams and Babel) tells the story of Uxbal (Javier Bardem), a Barcelona native who's diagnosed with cancer and given just weeks to live. More a visual poem than Hollywood narrative, Biutiful, weaves a half-magical tale of Uxbal's unraveling life. He lives with his two young children in a lower-middle-class apartment near the main tourist center of town, where he makes his living hustling between the various factions that survive in the crooks and crannies of urban life: the black Africans who sell knock-off handbacks and drugs to tourists; the crooked cops who take Uxbal's money to look the other way; the immigrant Chinese who make the handbags in a basement sweat shop. Uxbal tells none of his family or business acquaintances of his diagnosis - and neither does he tell his ex-wife, a recovering drug addict who re-enters Uxbal's life just as he is prematurely leaving it. If all of this isn't depressing you already, that's because you aren't listening to Iñárritu haunting score, watching his Kodachrome cinematography of muted blues and grays; listening to the spare poetry of Uxbal's mumblings and incantations as he tries to insure the care of his children and connect with the people around him. Iñárritu wants to take us deeply into both life and death, in a way films rarely dare to, and he wants to open up our experience of what it means to be human on planet earth. Uxbal also has a special gift - he can commune with the dead as their souls are departing the body - and the effect as illustrated in this movie borrows from horror-movie tropes (a la Paranormal Activity) and turns them on their head: instead of startled, we're deeply disturbed and disoriented, as if we'd literally - and not in a movie way - seen a ghost. Iñárritu clearly borrows from the Spanish literary technique known as magical realism as these scenes of supernatural spectators mingle with ordinary reality in order to take the story to the boundary between life and death. Biutiful is both beautiful and unforgiving - Iñárritu's unsentimental look at life offers us none of the usual comforting platitudes we usually get in films about the young and the dying. Uxbal's final weeks are both disorienting and painful. Even in the one moment when he does reach out and tell someone he's dying (it takes place in a disco, in one of the film's most heightened disoriented scenes), he's met with cold rebuff: such talk is not the stuff of daily life, and the woman can't tell if he's serious. If he is, then - as with most of the pain of life - her only reaction can be to ignore him and look away. Uxbal searches the remnants of his life for some connection: with his ex-wife, with his children, even with the blacks and Chinese he does business with. Even as he looks for some act of kindness to bestow upon this harsh world (yes, there are enough intimations of Christ-like sainthood and suffering here for a Catholic to love), Uxbal's efforts sometimes backfire, and sometimes to his horror. As his policeman-on-the-take friend sees it, we're all just here to get our cut, even Uxbal. Iñárritu wants to make sure that the movie - like life - gives no real hint of whether there is any salvation to be had, any reward for our faith, or if the policeman is right, and all we can make of existence is cynicism. This really seems, then, a movie for our time. Not only is there no religion, no family, no economy and no government in which to place our faith, we can hardly even trust ourselves. The one thing Uxbal does seem to be searching for is a connection with a father who died before he was born, a young man he never knew. But even his father's body is being dug up from its grave as they tear down the mausoleum to make way for a new condominium. I warned you this movie was bleak. At the same time, there's no denying it's beautiful. Iñárritu's imagery is amazing. The scene as Uxbal enters the disco to find his brother and tell him of the latest tragedy has to be the most effective use of emotional disorientation I've seen on film in thirty years. Even as he has blood on his hands, women dance around Uxbal with their faces transformed into huge breasts, his brother and friends laugh and drink, and the disco music spins the scene around. It's as if we - and Uxbal - are aliens watching human life from another world, barely understanding the rites and rituals we see every day. This strangeness is ultimately what Biutiful is after, and it gets to it in the most original way possible. By the time Uxbal comes to the end of his journey, we see what a human life leaves behind, stripped of the pretense of religion, the straight jacket of moral order, and the numbing in-authenticity of modern truisms. One by one, Uxbal's relationships with the world fall away. What remains is a strange kind of poetry, one we make from the half-recognized shards of our own lives, and a vague sense that in some small way, our presence in this world may be remembered by at least one person we leave behind. 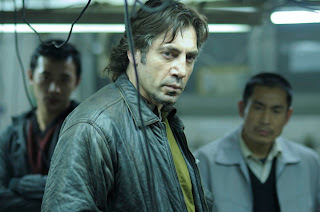 In showing this, Biutiful may be the first movie that shows us what our own death might really look like. Looking at that is not for everyone. But if you have the strength to watch it, Biutiful will leave you forever changed.